Olive Garden does it again! The Olive Garden Grilled Chicken Flat bread is an appetizer that you will want to order when you go to the Olive Garden. 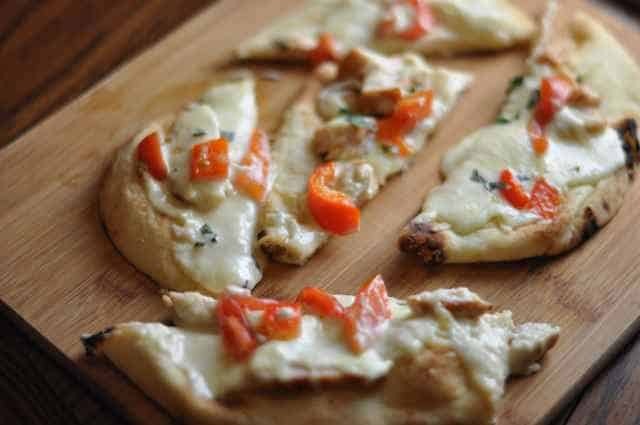 Grilled chicken, mozzarella cheese, roasted red peppers and basil on a flat bread crust with Alfredo sauce is a wonderful dish. This is the perfect appetizer or even a light dinner. Prepare Alfredo sauce, you can have the recipe, or you can simply cook up some pasta and enjoy some pasta with the Alfredo sauce. Season chicken breast with salt and pepper, and place in a skillet over medium-low heat with 1 tablespoon of cooking oil. Cook chicken breast for about 6 minutes on one side, flip over and cook chicken breast on the other side, this should take about 5 to 6 minutes. Slice chicken breast into small slices. Preheat oven to 350 degrees. Peel garlic clove, cut in half and rub cut garlic clove over the flatbread. Place cooked sliced chicken breast onto flatbread, coat the bread with Alfredo sauce, top with half of the grilled red peppers, and add sprinkle over mozzarella cheese on top of everything. Place into the oven and heat until the mozzarella cheese melts, this should take 6 to 8 minutes. Remove from oven, and top with remaining grilled red peppers and add chopped basil before serving. Preheat broiler. Lightly coat the red pepper with olive oil. Grill peppers under the broiler until the skin turns black and the pepper softens slightly. Place pepper into a paper bag to cool for approximately 20 minutes, and then peel off the blackened skin. Turn your flame on high, and with metal tongs place the pepper on the gas burner, flip over once one side is blackened, continue to do so until the entire pepper has been blackened. Place pepper into a paper bag to cool for approximately 20 minutes and the peal off the blackened skin. Gotta, say I thought this was great. Everyone in the house gobbled this one right up. We made our own flat bread with Greek Yogurt and self rising flour! Soooo good! We added onions and tomatoes to ours also. Just made it! My son & I looooooved it!!!! the best flatbread I’ve ever had. Thanks for sharing (BTW – I got lazy and bought the dough from my favorite pizza place). Peel- to take the skins off vegetables. peal- the large flat board (it looks like a large spatula) that takes pizzas out of the oven. Sorry, I am a bit of a grammar Nazi, more and more I see this word used wrong in blogs, surprising, since you seem to know a lot about food and food prep. Looks great, I love doing something besides red sauce on a pizza.